In this translated interview, originally appearing on Russian portal championat.com, Islanders prospect Ilya Sorokin talks about being part of Team Russia, discusses current season and confirms that he wants to play in the NHL. * For the original interview by Dmitry Groshev, click here. – First of all, congrats for your call to the National team. It isn’t all that usual to see a 19-years-old playing for Team Russia. What are your impressions? – Thank you! At first, I couldn’t believe [to get called to Team Russia]. Then, once I realized it, I was very happy. I know that this is just a sort of try-out, but I’ll try to do my best. – The psychological aspect is very important at your age. And recently, Metallurg Novokuznetsk’s head coach German Titov said that he doesn’t want to psychologically load you too much. In what conditions do you find yourself? – I agree, it’s an important aspect. I’m working hard during practices and I work with a psychologist. I think that all will be good. I try not to exaggerate and do my job at its best. – Goalkeepers are usually special characters. Why did you choose to play in goal? – For the first two years I have been a skater. But I always loved the way goalies stop the puck. So I moved to the crease. And I discovered that allowing a goal is truly bad (laughs). Sometimes an allowed goal makes me think too much and draws away my attention from the game, but I’m working on this aspect. – What is the main task for a goalie after an allowed goal? – Force yourself to think that the game is still 0-0. Focus on the game to play better. Unfortunately it doesn’t work every time. Probably it’s a matter of age and experience. – Do you have any goalie idol? – No, I don’t have idols, I have people I try to study from. For example, our fellow townsman Sergei Bobrovsky. – Novokuznetsk has a good young team, and you play there for long time already. How are things going in Novokuznetsk? – I play for “Kuznya” since I was 12. I played for them in kid’s hockey, then in the MHL. Last year I had my KHL debut. Our team plays hard every game. Our goal is to get to the playoffs. – Metallurg Novokuznetsk’s head coach is German Titov, who played almost 10 years in the NHL and won a number of medals on the international stage with Team Russia. How is he as a coach? – With him, it doesn’t matter how big of a contract you have or what is your position on the team’s depth chart when it comes to game discipline. If you don’t follow the game plan, someone else is going to play instead of you, even a junior, if necessary. He often talks with the players, but the discussions don’t get out of the locker room. – This is already your second season in the KHL and now you’re even a part of the national team. Are you used to feel yourself into men’s hockey? – Hard to say, it’s just the start for me. Of course, being called to the national team is something special, even if I played with the junior national team already. But the [senior national] team is another level. – How did you feel practicing with Kovalchuk and Radulov? – It’s great! They are great, they are stars. You always have a lot of motivation with such players. Considering how many goals they scored on me, I think that they will have to change the nets (laughs). – Team Russia’s head coach Oleg Znarok told the press that you’re going to play the game against Czech Republic at the Karjala Cup. Did you talk with him? – Not yet. I’ll be glad to play against any opponent. – How are you going to prepare for the game? – We’ll watch a couple of their games, and the coaches will tell me what should I focus on. – Let’s talk about another important event in your life. Last year you have been drafted by the New York Islanders with the 78th overall pick. What did you feel? – It has been a pleasant surprise. I didn’t expect to be selected that early. Of course I was very happy! – Did you talk with the Islanders after the draft? – They talked with my agent and invited me to their camp. – Why didn’t you move there? – I am under contract with Novokuznetsk for two more years. I don’t want to abandon my team now. 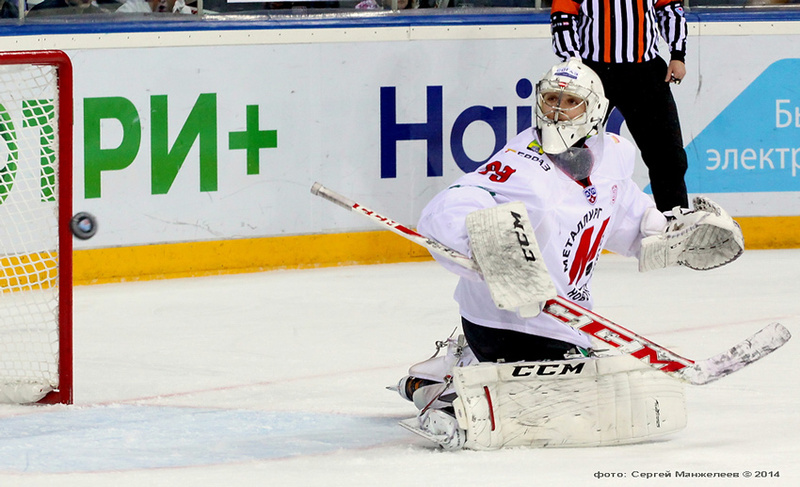 At first I should show that I can be the first goalie for Metallurg Novokuznetsk. Going to the NHL not ready is a non-sense. Everyone needs his time. I should grow stronger at home, then we’ll see. – Other Russian goalies Andrey Makarov and Vasilevsky are now playing in the AHL. They can get some experience there too. – I’m sure that all will be great for them. But I have my own path. I talked with my coaches and parents. I was more oriented toward staying in Russia at first, and they supported me. – But you still want to play in the NHL, right? – Of course! But you need to be ready in every aspect of the game. Of course, I’m ready to play in the AHL too when that time comes. – By the way, Andrey Makarov, during the Sabres training camp, when he was asked about his goaltending style, he replied “stop-everything-that-moves”. What would you reply to the same question? – I agree with Andrey one hundred percent. He replied very accurately. Each goalie should have such a style. – What is the worst goal you ever allowed? – Two years ago, during the preseason, we were playing against Ufa. I stopped a very strong shot, and the puck went flying in front of me. So I decided to glove the puck, but somehow when I was swinging the arm, the puck hit the collar of my glove and went in. In the locker room I was nicknamed “tennis player”. My coach told me not to give up because it won’t be the last (laughs). – And what was your best save? 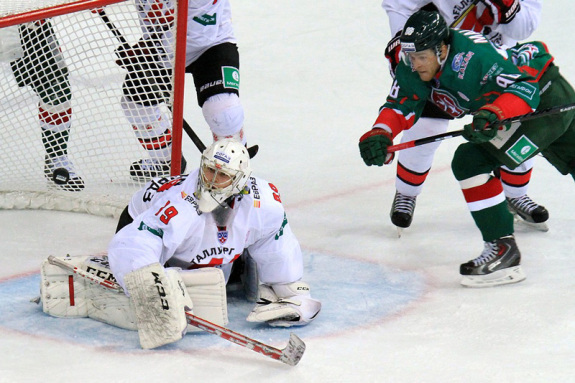 – Hm, well, a lucky save I had last year against Traktor Chelyabinsk. It was a two-on-one rush, they pass the puck on the other end of the crease, it was fairly far, so I stretched out and the forward shoots right on my stick. It was just luck. But of course, my best save is yet to come! – Last question: what are your goals for this season? – I need to show every game that I am a KHL level goalie, play well with Team Russia at the Euro Hockey Tour and get a WJC spot. I think that’s enough for this year!